Ruben Mosqueda of Metal Titians spoke with guitarist John 5, excerpts from the interview appear below. Metal Titans: You’re bringing in a little variety to [your current] tour by including Jared James Nichols, who brings on a Pat Travers vibe. John 5: I wanted him to be on this tour. I’m so excited that he was available to do this tour. I love, love great guitar playing and he’s just that, a great guitar player. I think he will certainly open people’s eyes to some cool blues power. John 5: It is just that surreal. I’m loving that. On this tour we’re going to have Corey Taylor [Slipknot, Stone Sour], Shavo [System of A Down], Fred Coury [Cinderella], Michael Anthony [Van Halen, Chickenfoot], my hero, [laughs] And that’s just for the Whisky [A Go-Go] show. I have a special guest that will be joining me for the first show, which will take place in Mesa, Arizona. He’s a great singer and I think this will be a huge surprise for people. I can’t say who it is but it will be so cool. John 5: [laughs] Oh, you’re right. There’s all housed in something or behind glass, they’re all protected in one way or another. You have to do that, because it’s history, there’s certain things that are one of a kind or that are really rare. So it’s absolutely, history. Listen, this is a great, fun hobby to have, I work so hard, I work so hard, so it’s a nice hobby to have. I get calls from friends who know I’m a collector and they’ll say, “Hey, I just found this or that.” They know what I looking for, it’s just a really great outlet for me, if you will. John 5: Oh, for sure, I think co-writing with Steve Perry was wonderful, I’m glad he’s back. I also think the writing session with Paul Stanley was amazing, being a longtime KISS fan that was a dream come true. I also co-wrote with Nikki Sixx a few songs for the The Dirt soundtrack, that was really exciting. I can’t even begin to explain how exciting it is work with my friends and heroes. I’m still pinching myself [laughs], it’s such an honor. 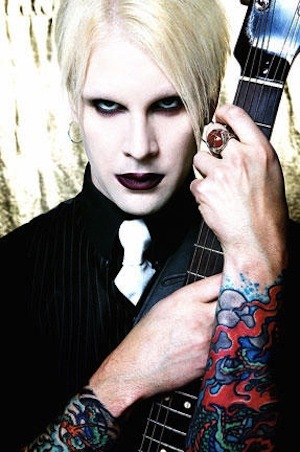 John 5: Mick is one of my favorite guitarists, I love, loved Motley Crue growing up. Not necessarily, I think it captured the Motley sound, because Nikki and I co-wrote the songs. We’d be sitting around, we had guitars in hand, we’d be watching t.v. or whatever and we’d come up with a riff and we’d build on it. We had all of these ideas and we compiled them and started putting songs together and we rocked them out! [laughs] Everybody just worked together, Mick, Tommy [Lee], Vince [Neil], Nikki and I, it was a great experience. It was such an honor for me to have been a part of that. Metal Titans: When we spoke last spring, you’d mentioned that you had an album in the can that you had recorded with David Lee Roth. You mentioned that it was in the vein of Ice Cream Man, and Could This Be Magic. Is there much movement toward that album making the light of day? John 5: [long pause] I think it will see the light of day, I’m banking on it, because it’s such a great record. I can’t say for sure, but I think Dave is working with Van Halen right now, which is wonderful. I’m happy for him, that’s one of my favorite bands. I think it will come out when Dave is ready to release it. I think you’ll love it, it’s a wonderful record. I’m so proud of the album. John 5: Oh, there’s just…that band and that voice, is like something that I’ve never before or since. That was so magical, the music was out of this world, it was so dynamic and such an excellent experience. She was also so cool, which was the icing on the cake. She was just so rad to me. We would be standing on the street and we’d try to pick up girls. It was one of those let’s see who can pick up who, you know? Basically, who would score [laughs] We’d do funny things like that, she was so fun to be around. John 5 is a MONSTROUS guitar player! If you don’t follow him on Instagram yet, stop what you’re doing right now and rectify that situation! His guitar noodling video clips on IG are absolutely brilliant! I’m seriously asking this….Does John’s KI$$ collection include any memorabilia of Fake Ace and Fake Peter? Personally, I refuse to buy any memorabilia that includes those fakers…..
John5’s tune with Perry is worth a listen. Glad Steve Perry has returned – his story is quite remarkable. Back in the day – his voice ruled the world. Interesting that he has an entire record with DLR recorded and finished. This is the first time I’m hearing that they even worked together. Eddie, Steve Vai, John 5, DLR does surround himself with great guitarists. Actually, John 5 played on half the tracks off DLR’s “DLR Band” album from the late ’90s. The album sold so poorly that I don’t even think it’s in print anymore. If you can actually get your hands on it, it’s got a couple of cool songs (Slam Dunk, Lose The Dress [Keep The Shoes]), but mostly throwaways.